Mitt Romney had a 47 percent problem. Hillary Clinton’s problem is 43 percent. That’s the share of Democratic caucus goers in Iowa who identify themselves as “socialists,” according to a recent Des Moines Register poll. It’s a percentage that has turned a once-easy line of attack – painting Bernie Sanders as too far left to be electable — into a trickier endeavor for Clinton in the last days before the Iowa caucuses. This gives one explanation of why the polls in Iowa are now so close, but it over-simplifies the situation. It is not really about socialists versus capitalists. Sanders’ views are far closer to those of European Social Democrats. He is not a socialist, and I certainly am not. The ideological divide, and the reasons I support Sanders over Clinton, are more complex. Using the flawed left/right ideological spectrum also creates more serious misunderstandings and feeds the Clinton camp’s false claims that she is more electable than Sanders. The left/right spectrum misses the fact that independents and voters in battle ground states are often hostile towards Clinton and that Sanders has a much better chance with such voters. Part of this is because of voters looking at character as opposed to ideology. Another factor is that Sanders is closer to the ideological center where voters who would consider voting Democratic fall. Style more than substance separates Trump from Hillary Clinton. After all, Trump was a generous donor to Clinton’s senate campaigns, and also to the Clinton Foundation. Hillary is nevertheless disingenuously promoting herself as the centrist between an extreme right-winger (Trump) and an ‘extreme left-winger’ (Sanders). Abortion and gay marriage place her on a more liberal position on the social scale than all of the Republicans but, when it comes to economics, Clinton’s unswerving attachment to neoliberalism and big money is a mutual love affair. Quite why Sanders is describing himself to the American electorate — of all electorates — as a ‘socialist’ or ‘democratic socialist’ isn’t clear. His economics are Keynesian or Galbraithian, in common with mainstream parties of the left in the rest of the west — the Labour or Social Democrat parties. Surely ‘Social Democrat’ would be a more accurate and appealing label for the Sanders campaign to adopt. I don’t totally agree with the placement of the candidates. I think they rank Clinton a little more liberal on social issues than she falls, ignoring her past position on gay marriage until politically expedient to change, and her association with members of the religious right in The Fellowship while in the Senate. I would also put a greater distance between them on foreign policy than described in the full post linked above. Despite these disagreements, the overall pattern is right. 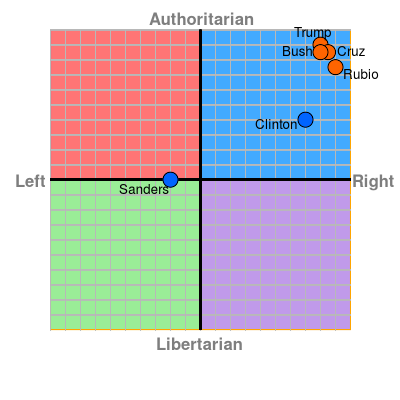 Clinton is a bit more moderate than the Republican candidates, but ideologically in the same authoritarian right area. Sanders falls closer to the libertarian than the authoritarian end where the other candidates fall, but not all that much left of center economically. Personally I fall much further in the left-libertarian section, falling much more towards the libertarian end than Sanders (although I also question if he shouldn’t fall somewhat further along the libertarian axis than shown here). It is no surprise that left-libertarians have been heavily in support of Sanders this year. This is the divide the Democrats now face. It isn’t that many Democratic voters are socialists, but we do differ considerably from Hillary Clinton in ideology, and do not see much of a difference between her and the Republicans. Obviously this will not apply to all Sanders supporters, and some could even manage to vote for Hillary Clinton in a general election without having to hold their noses, but it does apply to many of us. Many young voters share socially libertarian and secular views which put them closer to the left-libertarian portion of the political spectrum. Many of us older voters got more active in politics in response to the abuses of the Bush years. As I wrote earlier in the week, we are not going to be excited by a Democrat who advocates the same neoconservative foreign policy, has supported the same types of restrictions on civil liberties and expanded power for the Executive Branch, and who as actively worked to increase the role of religion on public policy. She has also been a hawk on the drug war. While better than the Republicans in agreeing with the scientific consensus on climate change, she is so indebted to the petroleum industry that her environmental policies have not been much better. Hillary Clinton is just a slightly more moderate version of George Bush. Yes, the Republicans have moved even further towards the authoritarian right corner of the spectrum, but that still does not leave Clinton as a desirable choice. Posted in Bernie Sanders, Civil Liberties, Donald Trump, Drug Policy, Economy, Environment, George Bush, Hillary Clinton, Libertarianism, Republicans, Social Issues. Tags: Bernie Sanders, Democrats, Donald Trump, George Bush, Hillary Clinton, Libertarianism, Republicans, Social Issues, Socialism. RSS feed for comments on this post.. TrackBack URL. Excellent post. FYI I saw a survey (november 2015 ?) that showed 40% of Sanders supporters would NOT be supporting "her" if she won the nomination. Supports your hypothesis. I really do not know how many Sanders supporters would vote for Clinton. From discussions in social media I find that many Sanders supporters are people who do not generally vote Democratic and I would not expect many to vote for Clinton. Others are usual Democratic voters, including many who voted for Obama in 2008. Some are the type who will vote for the Democratic candidate regardless of who they are, even if the candidate they voted for in the primary does not get the nomination. Others might draw the line at Clinton. It would be extremely foolish to not vote for Clinton if she wins the nomination. I'm a Bernie supporter, but if Clinton wins the nomination, I'll vote for her. Why? Because there's much more at stake than the next four or eight years; there's a Supreme Court that can have an undesirable impact on this nation far into the future. I'm pushing 70, so it isn't going to make a lot of difference to me, but it will to my children and grandchildren, and I care about their futures. So instead of pouting and sitting at home and acting like it doesn't matter who's elected if your candidate doesn't get the nomination, think of your children and their children. I'm sure they won't care about how principled you were when they're living in a theocratic nation. Fantastic post. I think I will read it again. Thank you Kevin. I’m curious as to how it will be taken when cross posted at TMV. Cheryle, nobody is pouting and acting like it doesn’t matter. Many of us think the question is more complicated than you suggest. Yes, there are reasons to consider voting for Clinton, primarily the Supreme Court. But these are far from the only considerations. Clinton is hardly the candidate to support if you want to avoid theocracy considering how she worked with the Fellowship to promote a greater role of religion on public policy. The question is not whether Clinton or the Republicans are worse. The Republicans clearly are. The question is what happens if Clinton is elected. She has spent her career undermining liberal values and enabling conservative ideas. We are seeing this again in this campaign. The big danger is that when Clinton makes a right wing argument, many Democrats go along with it. Right wing ideas have a far greater chance of becoming law under Hillary Clinton (as also happened with Bill) when both Democrats and Republicans go along. Democrats would oppose the exact same arguments coming from a Republican as compared to Clinton. Plus what happens long term if the Democratic Party increasingly becomes Republican-lite, afraid to propose any liberal policies or to stand up against the Republicans? If you do not want a theocratic nation, and a nation with perpetual warfare and perpetual surveillance, run by a plutocracy, Hillary Clinton must not become president. Is the risk of this higher or lower with Clinton compared to the Republicans? The answer to that is far from clear. At this point I would concentrate on supporting Sanders for the nomination, and worry about the general election after the nominees are chosen. Ron Chusid, which Republican would you vote for if Clinton is the Democratic nominee? I would not vote for any Republican. Even if this graph is accurate it seems to me it represents a Bernie problem. Our congress is elected by voters. It reflects the country. If you want progressive change, it needs to come from the ground up not the top down. Currently, I doubt that this country's voters will elect someone like Bernie – or the congress that he would need to support him. Yes there is a wave of support from young people and lefties. I'm thinking that it will break and crash somewhere short of election. Hopefully people will get past the heartbreak and dig in for the ongoing long struggle for fairness and justice. HRC is not nearly as progressive as I'd like. Actually, Bernie isn't either. But she is imo the best we currently have available. She will defend the hard won gains of the past and push for more where she can, unlike any of the R's. Most important, she is sane, and will at least realize that climate change is an urgent problem that needs attention, unlike the R's and their 'bring on the end times' mantra. Joe, this represents the “Hillary Problem” and explains why so many of us want to vote for Bernie. You are repeating the false argument that “Clinton is not progressive enough” which we hear so much. The reality is that Clinton is not a progressive at all. Her agenda is far closer to that of the Republicans and she wants to move the wrong way on far too many issues. Congress does not reflect the voters very well. Look at its approval rating. Electing Bernie would be a revolution from the ground up. Put Clinton in office, and most liberal change is already precluded. Look at how she has shot down Medicare for All during this campaign. Electing Bernie expands the window of what is possible. Other Democrats will be more likely to follow. Plus there is the bully pulpit concept that the president can expand what ideas are considered around the country–accompanies by support from the ground up. I am voting for president largely based upon what is more directly under the control of the president. With Sanders, as opposed to Clinton, we are far less likely to get involved in more foolish wars. Sanders would be more likely to reduce and reform the surveillance state, while Clinton would probably expand it. Clinton has always been a big supporter of increased Executive power and less government transparency. A Sanders Justice Department would address violations of the law from Wall Street far more aggressively than a Clinton Justice Department. Sanders and Clinton are so similar in stances it's hard not to find a sentence like "Hillary Clinton is just a slightly more moderate version of George Bush." laughable. It's less funny when I become concerned that some people willfully overlook the vast similarities to focus on small differences. I worry that a bunch of white guys are going to pull a Nader on us, in fact. If you want to come across as a WhiteGuy, please do write more like this. If you want to understand why so many of the rest of us Democrats are happy to have *two* good candidates – one of whom is a rock-solid feminist – talk to Democrats around you who aren't white, male, Bernie supporters. Please. A reminder of how similar the only two good candidates in the race are : when I take this in-depth test, I find myself with two candidates I agree with on over 90% of issues. Whoopee! If you only look at a very narrow segment of issues I imagine it is possible to come up with 90% agreement. One of the good things about the survey I used is that it actually looks at a wide range of issues. There is far too much disagreement between the sides to agree with 90 percent on the actual issues. You can agree with or disagree with Clinton’s views on Wall Street and trade as opposed to Sanders’s views. Both of them are strong on feminist issues, except Sanders is more consistent and doesn’t have a history of stabbing allies in the back when politically expedient. Many feminists do support Sanders over Clinton. There are far too many differences to take seriously a claim of agreeing with both on 90% of the issues. I believe this whole post to be somewhat biased against Clinton. I can tell by your comments, Ron, that you do not support her. When I look at polls I look at non-aligned and non-partisan polls. Just the wording of a question can impact a person's answer. Push polling is done all the time by both sides of the American divide. I am as liberal as they come, many call me radical in this town. But I have been active in politics since I was 16 working for Bobby Kennedy door-to-door and this idea that Hillary Clinton is republican-lite is ridiculous. And who in the feminist world did she "stab in the back"? As far as young women voters supporting Bernie Sanders, no doubt that is true. Most of them grew up in households with Fox News blaring in the background. They have heard the lies and exaggerations against Hillary all their lives. I used to be a republican and left the party on principle when Reagan was elected. I had won a primary that year and was privy to inside meetings about republican strategy from its conservative wing. They suggest their voters lie to pollsters whenever polled and to, when possible, to vote for the weaker Democrat in the Primary if you are willing to change registration temporarily or if you are registered unaffiliated or independent and can choose which party to vote for. I don't know your background. I am a fellow of the North Carolina Institute of Political Leadership, a non-profit, non-partisan institute to establish training of effective political leaders. One thing we studied extensively is polling. And let me tell you what I know from others I work with who are republican. If Bernie Sanders wins the nomination, the gloves will come off that day and he will be hit with the most negative attacks in the history of the republican party. Many of the ads are already prepared. Americans for Prosperity and American Crossroads have already hired thousands to do the dirty work door-to-door.They are gunning for Hillary because they know she can and has survived their repeated assaults. They will turn on Bernie Sanders as soon as he is nominated if they succeed in defeating Hillary Clinton. The instant generation (Millenials) needs to gain some political knowledge before falling head over hills for anyone. And any woman not voting for the Democrat nominee in November will be the republican party's victim for a generation, until the courts can be reclaimed by progressives. Don't be played a fool, guys. This election is our most important since the Civil War. And the same hatreds are pushing the Right in this campaign as then. Racism and sexism are real. Republican dirty tricks have been honed to a razor's edge. The damage will be fast and deep. Mark my word. The graph is from an independent source based upon the views of the candidate. There is no bias or push-polling in it. It just shows graphically what I have noted in multiple previous posts about how Clinton is too conservative. There are many complaints from feminists about Clinton failing to support their view. I linked to a few articles on it here. The argument about Republicans turning on Bernie is simplistic, ignoring how the Clinton machine, which is as dirty as the Republicans, has already been smearing Sanders. The Clinton machine is probably the dirtiest machine in all of politics. They gave us the Reverend Wright smears and started the Birther smears against Obama eight years ago. This year we have seen twisting of Sanders’ words to claim sexism, a distortion of his position on guns (never mind that Clinton was a self-described “church going gun supporter eight years ago), and claims that Sanders is going to take Medicare, Medicaid, and even ObamaCare away from people. If Sanders can survive the Clinton smears, he can survive the Republican smears. Besides, Republican smears have the most effect on people who listen to Fox and will never vote for any Democrat. They already think that Obama is a Marxist Socialist who is also a foreign-born Muslim. Attacking Sanders for being a Socialist won’t be any different from their attacks on any other Democrat. On the other hand, Sanders does not have all the baggage which they can easily attack Clinton with. First, let me state that I am not white and I am not male but I AM voting for Bernie Sanders. For anyone to make a post that implies non-whites aren't going to vote for Bernie or that the majority behind him are white makes is not just absurd, but it sinks of propaganda done to make people think he's a "good old white boy" candidate when nothing could be further from the truth. Those are the Republicans. Bernie has so many minorities behind him and so many women that it boggles the mind. Sen. Sanders has spent his *entire* career defenfing and supporting human equality – from marching with MLK Jr. when it definitely wasn't popular to be white and on that side of the road for non-politicians, never mind actual ones, as well as defending equal pay and the right to their own bodies for women (something the majority of men would never have thought to themselves, let alone voice it out loud back when Sanders took it public). This along with protecting our Vets, wanting affordable, if not free (as it originally started out and is still the legal way tuition should be handled), education, affordable healthcare for everyone – not just the rich, affordable homes (which used to be part of the American Dream but is now only part of the American Fantasy), lower taxes for people – not corporations… Which other politicians can say they still defend everything today that they did when they first took office – over 35 years ago as of 2016? HRC has made a good appearance at being for equality yet digging deeper (and only a few inches is needed), one sees that it's either an outright falsehood or a flip-flop from earlier days when she openly opposed the exact opposit (gay marriage is a prime example of this). Clinton is a personification of what a politician is: most of the time tell them what they want to hear while doing what you really want to do anyway (smoke and mirrors). The rest of the time tell them what you want them to do because you've now lulled them into a false sense of security. However, Bernie Sanders has not now or ever in his full political career swayed or flip-flopped from his current issues. He has been for the PEOPLE from day one and is still fighting for us. I'm 61 and have known a LOT of people, young and old, throughout my life and, including myself, I can honestly say that Bernie Sanders is the ONLY person I have ever come across that has not changed their values, goals or beliefs throughout their adult life. That alone is a reason to vote for him if you want the same things for America that he does. But make no mistake about it, if for some reason Bernie Sanders does not win the Primaries, I will vote for Hillary because she is still better than the best Republican. But rest assured, should she or a Republican be elected we will not see Obama's legacy continued. Most likely we will see Bush's agenda given a facelift to make it appear new and better but it'll still be the old and worn out agenda we suffered under for 8 years during 2001-2009.